The Dangers of Swallowing Disorders, which was recently featured in the Globe and Mail, showcases Dr. Rosemary’s Martino’s multi-site PRO-ACTIVE study. This study aims to determine what type of intervention – early or reactive – is most effective at treating swallowing problems among head and neck cancer patients undergoing radiation therapy. Posted in Uncategorized on January 8, 2019 by martinolab1. Dr. Martino was one of 21 recipients of new and renewed Canada Research Chairs at the University of Toronto this year. Total estimated funding for the chairs is $19 million. Dr. Martino’s Canada Research Chair (Tier 2) in Swallowing Disorders was first awarded in 2013 and helps to fund her research program, which focuses on understanding swallowing impairment (dysphagia) and its impact on the patient. Her aim is to conduct research that will assist clinicians in providing the best possible care to their patients and that will ultimately help reduce the burden of dysphagia for patients, their caregivers and the community. For full details about this year’s Canada Research Chair recipients from the University of Toronto, please click here. Posted in Uncategorized on November 22, 2018 by martinolab1. Victoria Sherman, a third year doctoral student, recently published the first systematic review on dysphagia following stroke in children. This review highlighted that, although limited data is available, dysphagia commonly occurs after childhood stroke, with reported frequencies from 24.2% to 88.6%. There is very little known on dysphagia-related health outcomes and caregiver burden, and no standardized tool available to identify dysphagia early following stroke in children. This review was the first study from Victoria’s dissertation research, and she is excited to continue her studies on dysphagia in children after stroke. Posted in Uncategorized on November 15, 2018 by martinolab1. Elissa Greco (PhD student) conducted a systematic review on dysphagia treatment for patients with head and neck cancer treated with radiotherapy. Through meta-analysis, she found that behavioural dysphagia intervention is beneficial to measures of swallow function and physiology, regardless of intervention start time. This study was the first to pool data from several randomized controlled trials and observational studies to determine the overall benefit from active dysphagia intervention. This study is now published in a high impact journal (International Journal of Radiation Oncology Biology Physics). Posted in Uncategorized on June 7, 2018 by martinolab1. Victoria Sherman, in the second year of her doctoral program, received the prestigious multi-year SickKids Clinician Scientist Training Program (CSTP) award (2017-2021). This scholarship is awarded yearly to only a few select students whose proposed research is based at SickKids and is judged as scientifically meritorious. As a recipient of this award, Victoria will participate in monthly seminars, attend annual national meetings, and have opportunities to meet and collaborate with other Canadian paediatric clinician researchers from a variety professions. Posted in Uncategorized on May 1, 2018 by martinolab1. 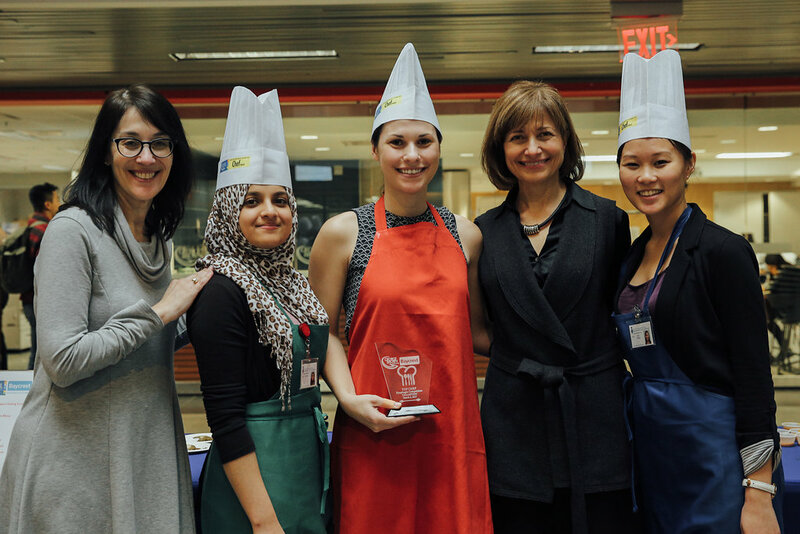 In April, Dr. Rosemary Martino had the honour of being a judge in George Brown College’s “Top Chef Challenge: Dysphagia”. This annual event, which takes place at the waterfront campus, involves teams made up of Culinary Arts students and staff from Baycrest, who compete to prepare a meal that is suitable for individuals with swallowing difficulties. The meal also has to be nutritionally balanced, aesthetically pleasing, and most importantly delicious. For more information about this event, please follow this link. Posted in Uncategorized on May 18, 2017 by rosemarymartino. Posted in Uncategorized on November 1, 2016 by rosemarymartino.